If you ask a New Yorker who has the best pizza in town, you will get many different responses. If you ask a Philadelphian, where can I find the best cheese steak, they will direct you to the corner of 9th and Passyunk Ave. Ask a Texan which city has the best barbecue and the list will be endless. The same goes on here in the Florida Keys when the topic of Key Lime Pie is mentioned. Everyone has an opinion and the debate as to who has the best has been going on for decades. The actual origin of the first key lime pie is unknown. 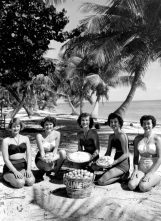 A wealthy Key West resident named William Curry claimed it was his cook “Aunt Sally” who first made the iconic pie for him back in the early 20th century. Others will argue Gail Borden’s invention of canned milk allowed local sponge fisherman to take this product out to sea for many days without spoiling. They added this to key limes and eggs and the first unbaked, crustless version of the Key Lime Pie was created. The mixing of ingredients and the acidity of the lime juice caused a chemical reaction and the filling thickened. Today all Key Lime Pies are baked because of the known dangers of consuming raw eggs. Many adaptations and recipes have been created since, but the three main ingredients, condensed milk, eggs, and key limes remain constant. A key lime is different than the regular Persian limes you are use to buying in the grocery store. It is tarter and has a more distinct aroma. 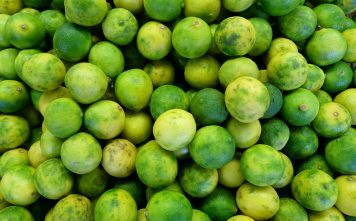 They are smaller than the Persian limes, still oval in shape, but have more of a yellowish color with thinner rinds. The key limes are juicier and the flavor is deeper and more acidic. Key lime trees are more susceptible to frost than other citrus trees. Back in 1926 a hurricane wiped out most of the citrus groves in Florida and they were replaced by Persian lime trees because they were more durable and economically more productive. Today most of the keys limes are imported. There are still many Key Lime trees in the Florida Keys and locally harvested for the Key Lime Pies. As mentioned before, authentic key lime pie has only three ingredients in the filling, key lime juice, sweetened condensed milk, and egg yolks. Minor variations have been tried to enhance the filling, such as the addition of whipped cream, sour cream, butter, vanilla or powdered sugar, but all seem to be feeble attempts to enhance an already perfect combination. The main arguments in the variations of Key lime pies are in the crust, Graham Cracker vs. Pie Crust and the topping, Meringue vs. Whipped Cream. So if you do the math, we really only have 4 options. Opinions are divided and the battles are fierce. Think Yankees vs. Red Sox, Jordan vs. Lebron, Coke vs. Pepsi you get the picture. Islamorada Times staffers Katie and Linda have taken it upon themselves to try the key lime pie almost every time they visit one of the area’s fine eateries. Here are some of their insights and a few reviews. 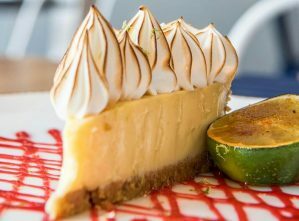 The fun thing about trying key lime pie at so many different establishments is that each stays rooted in the authentic taste of the Florida Keys, but each has its own twists and specialties that make it unique. Some people favor meringue topping, others whipped cream, and then there are the purists who want it plain. The taste of the filling can vary with some being creamier and others being more citrusy with a stronger key lime taste. 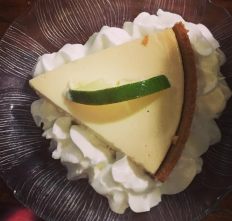 Here are some of the highlights and favorite key lime pies we have experienced while tasting this treat throughout the Keys. 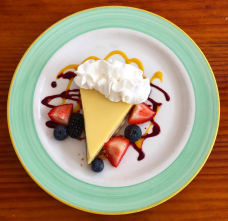 Morada Bay Beach Cafe: Morada Bay has a classic key lime pie with their signature flare being its presentation. Topped with a very small dollop of whipped cream and surrounded with berries, this pie is just as pretty to look at as it is to eat. Conch Republic, Key West: This is your all-around quintessential key lime pie. Served cold and plain, with a strong and citrusy key lime flavor, this pie is the perfect ending to a seafood dinner on the water in Key West. Lazy Days: An Islamorada staple. The generously sized entrée portions at Lazy Days and complimentary banana bread before dinner may have you feeling full by the time dessert rolls around. That’s why the Islamorada Times staff’s insider tip is to order your key lime pie to go. Take a nice stroll by the water to digest and hit up this not-to-sweet key lime pie when your stomach is ready for more. Hog Heaven: This may not be the first spot you think of when you are craving a key lime pie but we assure you it is just as good (maybe even better?) than the ones you’ll find at some of the fancier restaurants in the Keys. Perfect for a mid-day dessert after lunch. The Key Lime Festival, usually held on or near the 4th of July, is 3 to 4 days of eating, drinking and celebrating all things Key Lime. 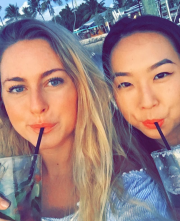 Test all the versions of Key Lime Margaritas and Martinis, stroll the streets of Old Key West and sample some of the best Key Lime Pie on the Planet. Then cheer on the entrants to the famous Key Lime Pie eating contest. It is quite the spectacle and fun for all. 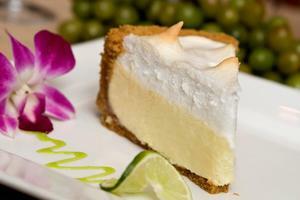 Key Lime Pie is a must when visiting Islamorada and the Florida Keys. Try several different versions and choose your favorite and become part of the ongoing debate over our succulent dessert. Images provides by Angler and Ale, Green Turtle Inn, Hog Heaven, and Morada Bay Beach Cafe.